I am planning a trip somewhere in North Carolina? How do I find out if there is a disruption (major crash, construction, flooding, snow and ice, etc.) on a NCDOT maintained roadway? Select the Region, Route (I-40, US421, NC42, etc. ), County or Project you are interested in from the pull down lists found in the middle of the TIMS home page. For smaller routes (secondary roads) select the county that the route is in from the pull down list. This list will show all of the known incidents in that county. If the road you are interested is not listed there then, NCDOT is not aware of any major disruptions on it. What is the "Special Alert" at the top of the Page? The Special Alert is a report of a major incident that has the possibility of impacting a large amount of traffic traveling in NC. The Special Alert may contain information pertaining to a major accident on a North Carolina Interstate that is anticipated to last for a long period of time, impacts on several roadways due to a weather event, ie – snow or flooding, or it can provide information on active AMBER alerts in NC. Where are the cameras located and who operates them? Drivenc.gov shows traffic cameras that are operated by NCDOT and by various cities throughout NC. In most cases, NCDOT operates the cameras that are located along North Carolina’s Interstates and major US routes, while cameras located on local roads within the cities are normally operated by the city governments. Where can I get traffic counts? How can I get a map of NC and/or individual counties? Click here for the NCDOT Maps page. If you would like a free North Carolina Official State Transportation Map call 800 VISIT NC. Is there a number that I may call to get road information? Yes! You may call "5-1-1" to get the same roadway information as you can on this site. May I get a list of any/all road closings? Yes! The information can be found on the Traveler Information Management System (TIMS) home page. In the bottom left hand corner of the main page click on "Download all Active Incidents into Excel" for a spreadsheet showing all the active incidents statewide. What Are Mile Markers (MM)? 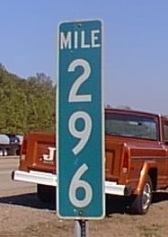 Mile Markers (abbreviated MM) are the small green signs with white numbers that are located off the shoulder of major highways. Mile Markers are used to help DOT and the public have a reference point along the route. They are located every mile and indicate the number of miles from the beginning of the route in North Carolina to that particular point. On North-South routes, zero begins at the furthest point south and increases as you travel to the north. For example on I-95, Mile Marker 0 is located at the NC/SC border and Mile Marker 182 is located at the VA/NC border. On East-West routes the milemarkers begin at zero beginning in the west and increase as you travel east. As an example, on I-40, Mile Marker 0 is located at the NC/TN border, and Mile Marker 420 is located in Wilmington, NC. Milemarkers also correspond to Exit Numbers along all interstate routes in NC. What types of "events causing severe and unusual congestion" are shown on TIMS? The TIMS system is designed to give travelers information on the types of events that most often cause delays on our highway system. These include major accidents, construction or maintenance projects, and natural disasters that affect road conditions. Information on these types of events are entered by NCDOT field forces with the goal of having the information be as timely, accurate and helpful as possible. Please be aware that realistically not each and every event that occurs on the highway system will be shown on TIMS. In the cases of some accidents, NCDOT may not be made aware of the accident as it may be handled by Law Enforcement personnel. As resources and partnerships with other agencies permit, more and different types of events will be added to our system. Similarly recurring delays, such as rush hour congestion, is not feasible to include in the information on TIMS since it is ever changing. AMBER Alerts and evacuation information will also be included on the TIMS system. What roadways are included in the TIMS system? The list of roads available in the pull-down menu on the TIMS home page contains Interstates, US and NC Routes. These are typically more "major" routes including freeways, divided highways and major connecting roads. Smaller neighborhood and rural roads that are owned and maintained by NCDOT are accessible by selecting the county that they are located in. This can be done either by selecting the county name from the pull-down list or by clicking on the map in the appropriate region on the TIMS home page, then clicking on the desired county from that region. These roads are usually given a 4 digit "Secondary Road" or "SR" designation (such as SR 1329 or SR 4005) will be displayed, in addition to the name of the road that most people are familiar with (such as "Leesville Road" or "Kelly Road"). Any known events on a Secondary Road in the selected county will be listed when that county is selected. What does the "County Alert" represent in the County information? This is similar to the Special Alert, which is found on the TIMS home page. County Alerts, found on each individual county page, will provide information on an incident that is having a significant impact on travel within that area. The county alerts can also provide information on closures/impacts that are not on state maintained roads. So if a city street is closed down, and we are notified, we can input that information into the County Alert field. When I am looking at incidents what do the colored balls signify? The colored balls are anticipated impacts, whereas the colored lines on the map are actual current impacts. An AMBER Alert is the broadcasting of information via radio, TV, and highway signs alerting the public to the abduction of a child in North Carolina. The AMBER Alert provides information, when available, to the public about the characteristics of the abductor, the description of the abductors vehicle, including license plate number, the description of the child that has been abducted, and the last known location that the child was abducted from. When an AMBER Alert is activated, highway signs in NC will direct the public to call 511 to obtain all information that is available about the child abduction. Click here to access information on NC’s AMBER Alert System. What do the different colors on the maps denote? When there is no colored line on the map it means that there is not enough data to provide this information. Does TIMS include data about oversized or permitted vehicles? Entries in the data field "Overturned Commercial Vehicle" prior to August 28, 2017, refer to oversized (i.e. permitted) vehicles, which are large and require a convoy and flagger. From that date onward, the entries in the field pertain to Overturned Commercial Vehicle.